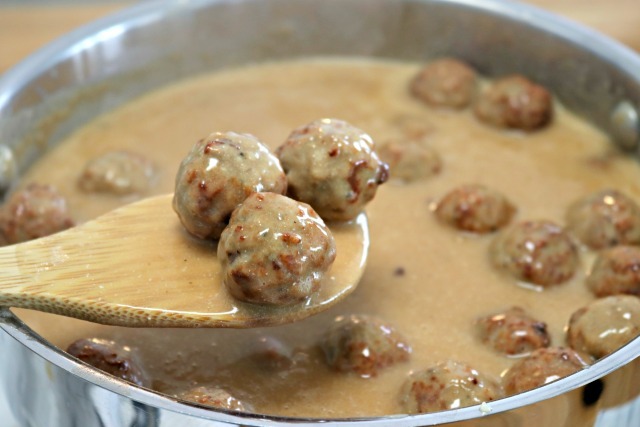 These Swedish meatballs are so delicious, and easy to make too! From start to finish, you can have this meal on the table within 3o minutes, and your family will love it! This year, I have vowed to make meals as easy as possible from start to finish. I also wanted to add some new recipes to our weekly menus that our kiddos will actually eat. On a recent trip to IKEA, my daughter and I discovered Swedish meatballs, and WOAH! They are so delicious! My daughter loved them so much that she asked if we could have it at home sometime, and of course, I said yes! 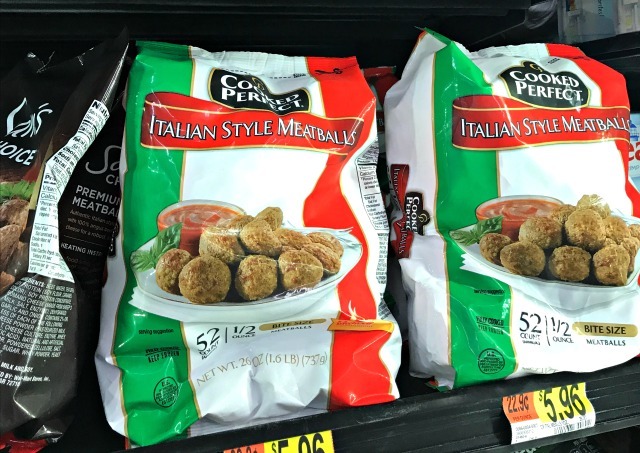 On a recent trip to Walmart, I was perusing the frozen food section and saw that Cooked Perfect® offered frozen Homestyle Meatballs made with chicken, pork and beef. 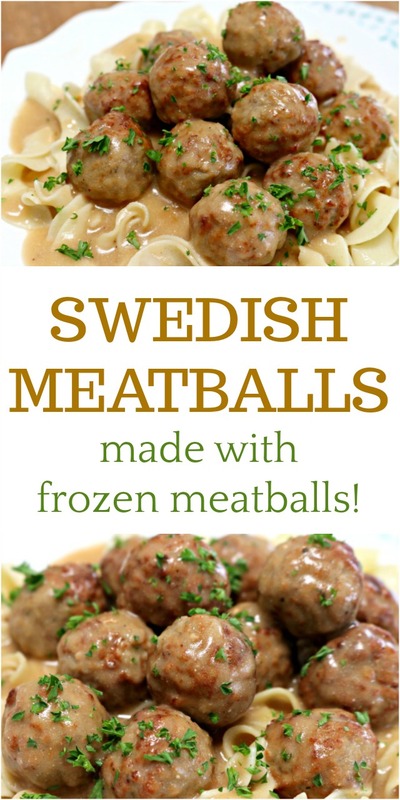 I have used their Italian Style Meatballs many times for meatball subs and spaghetti and meatball dishes, but for this dish I didn’t want the Italian flavor, so these were the perfect choice for Swedish meatballs! So, I grabbed a bag and brought them home! To start this recipe off, I followed the instructions on the back of the Cooked Perfect Meatballs bag, and cooked them in the oven for 20 minutes at 350 degrees. While the meatballs were cooking in the oven, I started melting 1/4 cup of butter in a saucepan on medium-high heat. 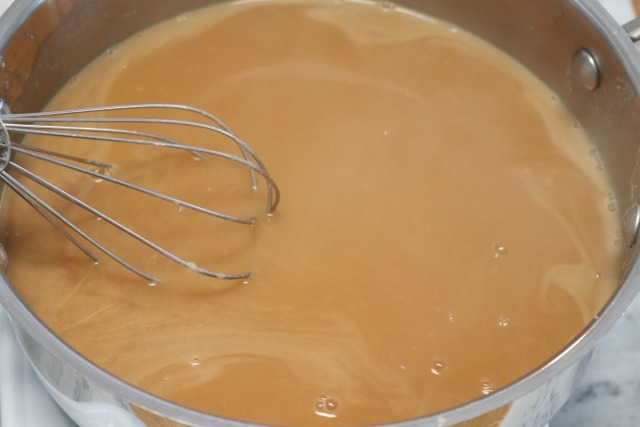 Once the butter was melted, I added in 1/4 cup of all-purpose four and whisked it together with the butter until it browed up a bit, making a roux. 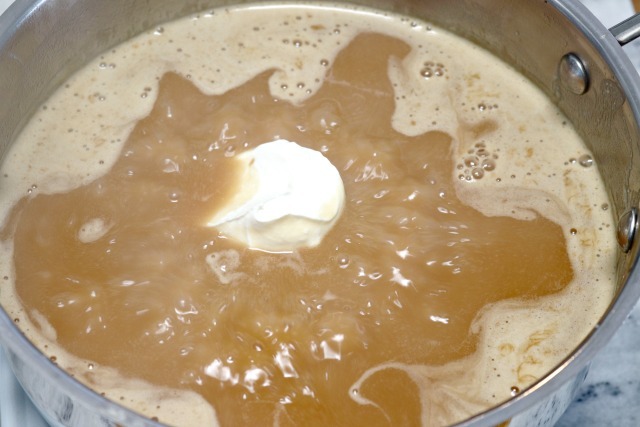 Once the roux was slightly browned, I slowly stirred in 4 cups of beef broth, whisking the entire time. I let it cook for 2 minutes, and it thickened up. Once the sauce thickened up a bit, I added 3/4 cup of sour cream and whisked it in until fully combined. Now it’s time for the fun part! Let’s add in the cooked meatballs to the hot tub! Once the meatballs are in the sauce, I let them cook in the sauce for 10 minutes so all the flavor from the meatballs and sauce would really combine well. Once they finished cooking, I wanted to make sure to serve them with something that could soak up some of the sauce and pair nicely with the meatballs too, so I chose egg noodles. 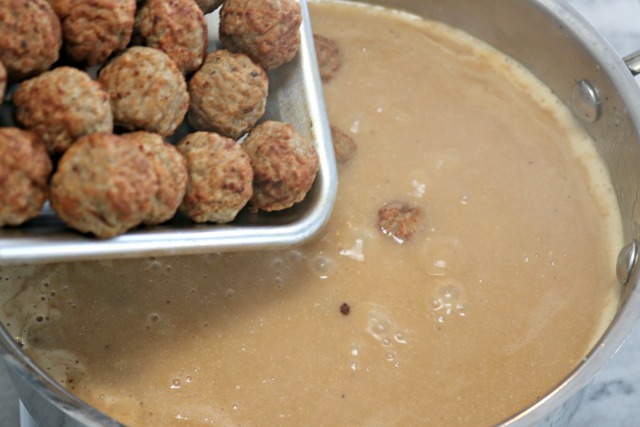 While the meatballs are cooking, melt 1/4 cup of butter in a saucepan over medium-high heat. 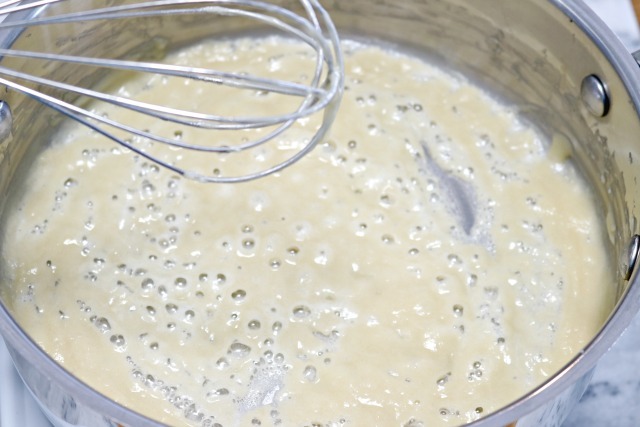 Once butter is melted, whisk in 1/4 cup of all-purpose flour and continue to whisk until it browns up and thickens a bit. Slowly stir in 4 cups of beef broth and whisk while cooking for 2 minutes, or until it starts to thicken. Once the sauce has thickened, add 3/4 cup of sour cream and stir well. Now add your baked meatballs to the sauce and let cook for 10 minutes. Serve immediately over cooked egg noodles. Y’all, I can’t even tell you how delicious these Swedish meatballs turned out! The meatballs were nice and moist, and really soaked up the sauce that I made. My entire family gave them two thumbs up, and Kate said they were even better than the meatballs that we had at IKEA! The best thing for me was not having the pressure of having to make homemade meatballs, brown them and then cook them on top of creating the sauce to go with them. 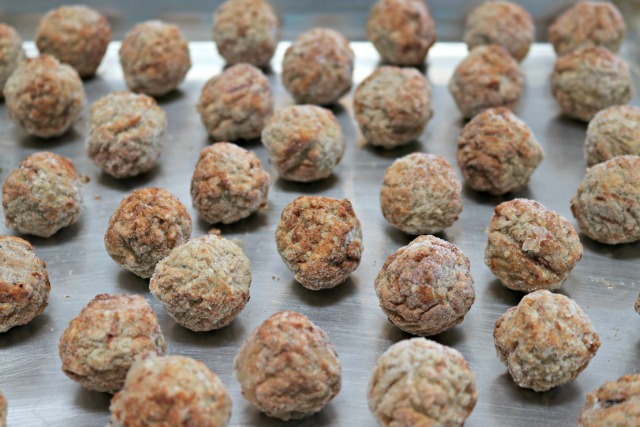 These Cooked Perfect® Meatballs really were just that…cooked perfectly and delicious! I could really tell that they had been made with quality ingredients and flame-broiled before freezing, which made them taste just like homemade! You can Find Cooked Perfect Meatballs in your grocer’s freezer section, and believe me, you will want to pick up several bags to keep stocked in your freezer for those nights when you don’t know what to cook! 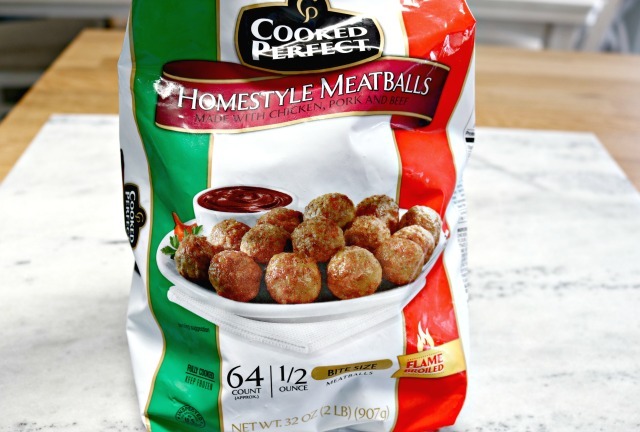 They are a huge time saver, so delicious and you can use them in tons of meatball recipes! 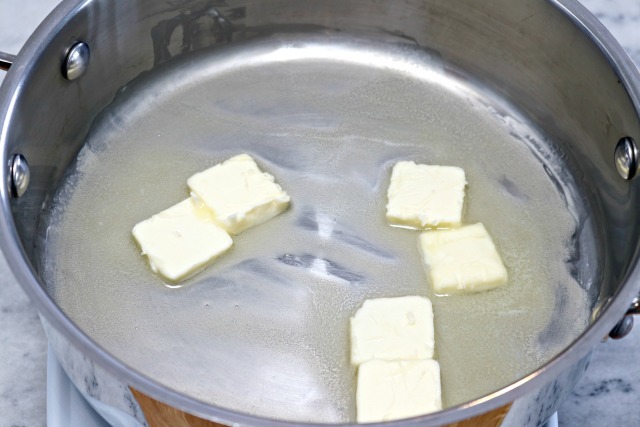 The ratio of butter to flour is not right. It had no real gravy; just a sticky, glue-like substance although the flavor wasn’t bad.. 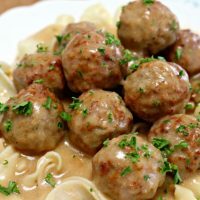 I think with a 1:1 ratio of butter to flour would be more appropriate, at least that is what I intend to try the next time I want Swedish meatballs and don’t have a lot of time to make them. Thank you for the recipe. The recipe calls for 1/4 cup of flour not 3/4. The sour cream was 3/4. But even with 1/4 c of flour my sauce was a bit thin but still tastes delicious. Yum! So easy and delicious! I’ll definitely use less flour next time (I should have read the comments first!). There is no need to bake the meatballs in the oven — I just put them in the sauce and let them simmer until heated. I did add the sour cream at the very end because I didn’t think it was a good idea to let sour cream simmer for so long. This recipe makes a lot! With two adults and two teenagers, we have a lot of leftovers. 26 oz or 1.6 lbs. How many meatballs would that be? I tried this recipe today because of the simplicity. It was amazing! I have never made Swedish meatballs before and I was sure missing out. Thanks for the great recipe! I made this for my husband and daughter tonight… it was a hit! I added the meatballs a bit sooner than the recipe called for and added some dehydrated onions from our garden as well as a bit of nutmeg. We served it over egg noodles like my mother used to. Thank you for sharing this quick easy recipe! This is my 2nd time making this recipe…Love it!!!!! Thank you!!! This looks great! But is the amount of flour 1/4 cup or 3/4 cup? The list of ingredients and the directions say different amounts. Thanks! Very easy recipe. Tasted yummy. Next time I will use more flour. Or use less broth. I couldn’t get the sauce to thicken once I added the broth. Will be made from( You guessed it frozen meatballs.If We are such a hurry to cook classic dishes like these beauties, do We deserve the real thing anyway? After adding the sour cream and letting summer for a while (stirring constantly) there seems to be white flakes on top of the sauce. Does this mean my sour cream was bad??? Is it safe to eat??? I also added some beef gravy for more flavor. I’m not sure what the flakes could be, but I hope your sour cream wasn’t bad. I can’t tell you if it is safe to eat without seeing, but fingers crossed that you figured it out. Best of luck! The sour cream probably curdled from the heat. These we’re very easy to make on a busy weeknight and yummy! Even my two-year-old and 8 month old loved it, thanks for sharing! I’m so glad they loved it! Can I use frozen italian meatballs instead of the homestyle ? I grabbed the wrong bag. Absolutely…the taste will be a little different, but I’m sure it will still be delish! I made this awesome recipe, but the gravy did not get thick at all, I had to add more butter and another 1/4 of a cup of flour, and by the time all was done, it took an hour and 33 mins. Looks good to me. FYI- IKEA sells their Swedish Meatballs at their store. Just remember to bring an insulated bag when you go to shop. Thanks for sharing. Any suggestion for a sour cream substitute? Plain yogurt can be substituted for sour cream. INSTEAD OF SOUR CREAM I USED ONION DIP AND CREAM CHEESE WITH CHIVES EXTRAORDINARY FLAVOR !! WOWWW! I just served these and they were a hit. One change I made was I added 1/4 tsp of both nutmeg and allspice to the sauce. The sauce was too thin. The flavor is good but I prefer a thicker sauce. You could always thicken the sauce up a little bit at the end using some cornstarch. Good recipe! It’s nice to not have to make scratch meatballs first. If you’re looking for an authentic Swedish experience, you’ll need to add allspice and grated onion to your meatballs. You can use nutmeg, though, as the flavor is similar. The sauce needs cream, not sour cream, and they are served with mashed potatoes. It was a popular dish growing up. My fathers mother was from Sweden (she spoke almost no English!) and my mother learned her recipe before passing it on to me. I do like them over egg noodles, though! Can I put it in a crockpot to keep it warm? OH MY GOODNESS! I am vegan, so I substituted the ingredients and this was SOOOOO delicious! My husband was very impressed! Thank you for sharing!! Lol, after removing the beef, beef broth, and sour cream to adhere to your vegan diet, what was left? Can I make this dish the day before and reheat the day if my party? Absolutely…I almost like them better the next day! This came out really good! I was very surprised considering how simple this was. I followed the receipe mostly except that I used one can of beef broth and one can of chicken broth. (I had to use chicken broth because i didnt have another can of beef). I seasoned broth mixture with garlic and slap yo mamma seasoning. That’s it. This is something i will definitely make more often. I’m making this now and used mushroom broth with sauteed mushrooms with a tad thicker roux with no noodles, a little oregano in the roux, with mashed potatoes on the side, gonna use the rest of it tomorrow with noodles. DELICIOUS!!! Aaaaah!!!!!! I followed the directions as written and my sauce came out runny. I’ll try again with less broth and possibly corn starch as a thickening agent.